Last weekend, the political and sports worlds collided “bigly.” On Friday, President Trump strongly criticized athletes for kneeling during the national anthem (to protest police killings and criminal justice inequities for people of color), saying ownership should fire athletes who kneeled and calling them an expletive. In reaction, NFL players, coaches, and owners demonstrated on a grand scale across the league. 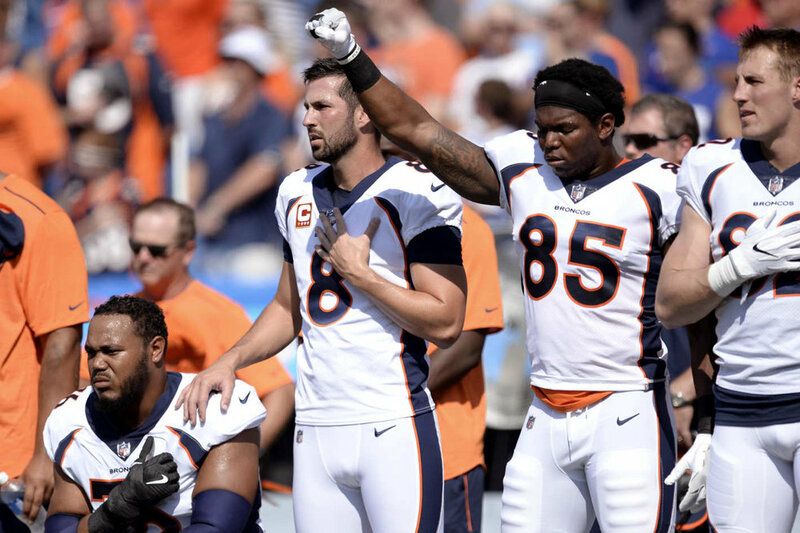 Unlike last football season, when only a handful of players participated in peaceful protests, this weekend, entire teams (and even the first MLB player to do so—rookie Athletics catcher Bruce Maxwell) kneeled, linked arms, released statements or chose not to take the field at all during the national anthem. The widespread demonstrations on the sports field brought out a familiar refrain from commentators and sports fans on both mainstream and social media, "Stick to sports." We've previously discussed on this blog a bit of the history of "Athletivism"—or athlete activism—looking back at Muhammad Ali protesting the Vietnam War or Jackie Robinson opposing segregation or Tommie Smith and John Carlos’s black power salute on the podium at the 1968 Olympics. Using sports as a platform to address political issues has not been limited to individual athletes—governments have taken advantage of the same opportunity. In 1980, the United States led 65 nations in a boycott of the Summer Olympic Games in Moscow to protest the 1979 Soviet invasion of Afghanistan. International bodies have also used sports to advance causes—the United Nations General Assembly adopted the International Convention Against Apartheid in Sports in 1985. Athletes using their platforms to speak out on public policy issues is no different than Hollywood stars or musicians using their celebrity to advocate for a cause, billionaire CEOs raising the alarm about a global issue, or companies participating in the debate around legislation. So why is it that sports are singled out in American culture as the only venue where political discourse is entirely taboo? Why is it that athletes meet such resistance, not necessarily for the position they take on any given issue, but for speaking out at all? In today's world of social media and the 24-hour news cycle, many fans and sports writers anxiously follow their favorite athletes' lives beyond the field or court—from their love lives to business ventures. Athletes' political views and social commentary are part of that package. Sports is part of our culture. The different facets of our culture—sports, music, literature, art, politics, business—do not exist in silos, but in a free flow of ideas and influences. Politics has often been the subject of music, literature, and art. And we're all familiar with the business of sports. Athletes are learning that sticking to sports can mean a huge lost opportunity to leverage their earned platforms to bring attention to and hopefully start a dialogue to find solutions for inequalities that affect their communities and beyond. At Athletivate, we celebrate professional athletes, leagues, players associations and other sports organizations who understand that there are societal issues that are more important than any game, while also recognizing the role that they and sports themselves can have in positively impacting those issues. We've written before about the unifying power of sports and we applaud the league officials, team owners, coaches and players from across professional sports who refused to stick to sports this weekend and spoke out with messages of unity to counter divisive rhetoric.